As Christianity rose to prominence in the Western world, it changed how people viewed themselves, and their place in the universe. This transformation affected everything from how they viewed their bodies, to how they viewed those around them. Christianity even changed how people died. Death was no longer seen as a curse to be avoided but as a moment of consecration that united the dying more fully with God. Bodies were no longer seen as polluting forces or irrelevant shells, but were recognized as an essential component to being like Jesus. Corpses were no longer cast off as dangerous sources of defilement, but were embraced as links to living people, part of an unfolding story, transformed by the unmerited graces of the God of resurrection. Death became something that was entered into willingly and with thanksgiving, first in baptism and then repeatedly in the communion meal known as the Eucharist. Even the eventual bodily death of a person was utterly transformed in the light of the belief in Jesus’ own resurrection. All of life was lived differently because of that central shift in the paradigm that formed the worldviews of the early Christians. This book seeks to see how and why the early church understood the central reality of the death of Christ as a foundational inaugural event, and how that affected how they viewed death in every other part of life. 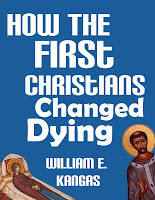 It explores how early Christian beliefs about death changed the practices of the church, the worldview of the culture, and the practices of society.